but I think the bunting needs to come out of the storage cupboards and we need to get ourselves ready for a very special Beatles anniversary! There are a lot of albums celebrating big anniversaries this year but there is something about a fiftieth that is truly epic and unbeatable. Maybe it is the length of time elapsed or the fact it just seems so unlikely – those legendary albums come up for their fiftieth and it allows the generations to come together. I was not born when The Beatles’ Abbey Road turned fitly on 26th September, 1969 but it is a record that was a big part of my childhood! My mum always highlights that medley that forms most of the album’s second side. In 1969, it was rare to have a medley of songs on an album, whether it was from a huge artist or someone unknown. In fact, in 2019 we do not have that many medleys – or single tracks composed or various different vignettes! That is masterful and wonderfully handled by the band but there are so many other treats through the album. I feel the fiftieth anniversary of Abbey Road will be the most important milestone of my lifetime. In terms of albums from iconic artists, can you name any more important?! Many consider other Beatles albums finer but the critical and fan opinion seems to have swung the way of Abbey Road – even if, for a time, Sgt. Pepper’s Lonely Hearts Club Band has taken the top spot before. Many will argue Revolver is a better record but for its sheer significance then you cannot top Abbey Road! Remember, the band had already recorded 1970’s Let It Be before they set to work on Abbey Road: it is their finale and the last time the band would record together in the studio on a full album. The experience of Let It Be was quite tense and unhappy and, when that album turns fifty next year, I wonder whether it will get the same impact as Abbey Road – I really do not think it will. The band went into recording Abbey Road with an aim: as it was their final album, they would get rid of the tension and try and get back to where they were before. To be fair, there were some tough times during recording and a bit of that friction remaining in the air! George Martin had to be asked back as producer by Paul McCartney after the tension of The Beatles (1968) and the fact Phil Spector produced Let It Be. The fact everyone was back in the same studio was a relief and produced some of the best music of The Beatles’ career. I will come to my argument regarding the importance of this anniversary but, after the fraught electricity that produced Let It Be, Abbey Road began life on 22nd February, 1969. Billy Preston accompanied the band on Hammond organ and the final album came together on 20th August. That was the date is memorable because it was the last time every Beatle was in the studio together – I think a separate celebration/anniversary should be held for that! Paul McCartney and John Lennon had enjoyed working on the non-album single, The Ballad of John and Yoko, and that bonhomie carried on in the sessions of Abbey Road. Although the experience of recording this time around was better than the last, there was tension and arguments between the entire band at some point! There are exaggerations as to how much of a role Yoko Ono played in these fall-outs but it was clear, by 1969, the band as they once were had disappeared. Lennon and Ono were together a lot and there was still a sense of McCartney trying to keep it together and guide things. It is the two halves of Abbey Road that fascinate me. The first has more conventional numbers and traditional Beatles songs and the second is dominated by that suite. If Lennon was still digging at McCartney because some of his (McCartney’s) songs were for grannies, then the band as a whole had a point when McCartney presented the odd Maxwell’s Silver Hammer – endless takes and hours were spent putting it together to the point the rest of the group had had enough! There are truly remarkable tracks throughout Abbey Road. George Harrison’s Something is viewed by many as the finest track on the album – and one of the band’s best – and Here Comes the Sun is an incredible track. Harrison was really coming into his own as a songwriter on the final album and it makes me wonder how strong The Beatles would have been if they recorded more records – knowing they had three world-class songwriters penning the tracks! Come Together is a stunning opening and Lennon’s I Want You (She’s So Heavy) is unlike anything The Beatles ever produced. The band was taking their music, as usual, in all sorts of directions and this near-eight-minutes-long-wonder-piece just suddenly stops...and with it the first half of the album. The second side has the relief of George Harrison’s Here Comes the Sun welcoming people back in before we start to enter that medley. I think the fact that suite of songs was so unheard of an inventive deserves accolade all by itself. It would have been a huge gamble for any band but for The Beatles, regardless of their strength and situation, it was a massive deal. They were always pioneering but they had never tried another like that song-cycle on the second side. The End ends things (well, the hidden track, Her Majesty, does!) and you are left breathless and try and take everything in. Many argue about The Beatles’ discs and which one comes where. Sgt. Pepper’s Lonely Hearts Club Band and Revolver have competed for top place but Abbey Road has always been up there. I think, the more time that elapses, the more Abbey Road will be seen as their most important album. There are several reasons why The Beatles final-recorded album’s fiftieth anniversary is vastly important. This will be the last truly big anniversary of any titanic Beatles album (fifty, seventy-five etc.) with any surviving members. The songs are wonderful and, after a brief blip, see the world’s greatest-ever band returning to their daring best. A few iffy tracks here and there (Octopus’s’ Garden and Maxwell’s Silver Hammer) add to the charm and mood and I cannot find anything to fault. The production is fabulous and I love the fact there is this distinct tale of two halves. The fact there was a hidden track was a bit of a first. I cannot think of any big Pop/Rock band before 1969 doing that and, since then, artists from all corners have been popping in hidden tracks. Remember this was the last time The Beatles recorded together and it was the end of an era makes Abbey Road’s fiftieth anniversary bittersweet. I have not even mentioned Abbey Road’s iconic cover – The Beatles were no strangers when it came to creating these immaculate and brilliant covers! The group was still pushing forward in all facets of its art, whether devising some of the greatest harmonies to be heard on any rock record (especially on "Because"), constructing a medley of songs/vignettes that covered much of side two, adding subtle touches of Moog synthesizer, or crafting furious guitar-heavy rock ("The End," "I Want You (She's So Heavy)," "Come Together"). George Harrison also blossomed into a major songwriter, contributing the buoyant "Here Comes the Sun" and the supremely melodic ballad "Something," the latter of which became the first Harrison-penned Beatles hit. 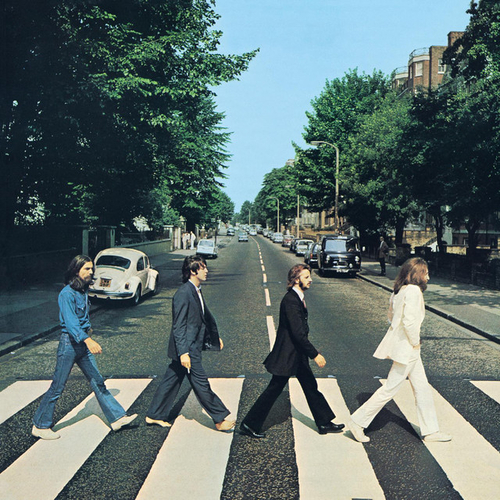 Whether Abbey Road is the Beatles' best work is debatable, but it's certainly the most immaculately produced (with the possible exception of Sgt. Pepper) and most tightly constructed”. It is sad to think that, after we mark Abbey Road’s fiftieth, the next major anniversary is a long way away – maybe sirs Paul McCartney and Ringo Starr will not be with us! We have those emotional reasons and the quality of the songs; the inventive aspects of Abbey Road and the iconic cover; the fact it was the final time The Beatles recorded and album and the record has endured for so long. It is a long way away but I do wonder whether there are plans coming for something unforgettable. Last year, there were celebrations regarding The Beatles (‘The White Album’) and that was great to see. That album is fantastic and the fact it is so sprawling and eclectic made it ripe for dissection and fresh investigation.